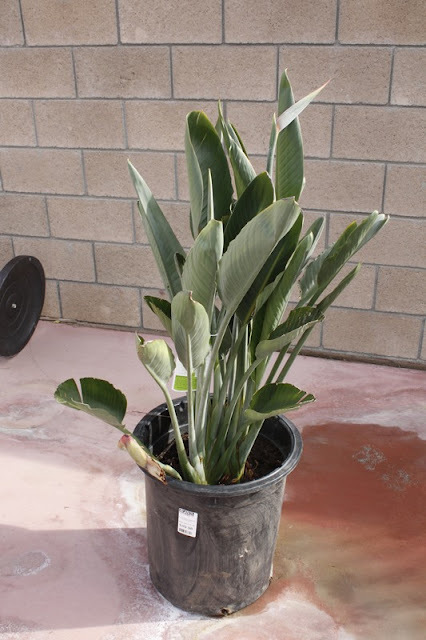 Back in our last USA home, we had a large pot of Strelitzia reginae, the Bird of Paradise plant. It never had any really special treatment, although I did feed it sometimes. It flowered profusely, sometimes having as many as twenty or more flower spikes at any one time. 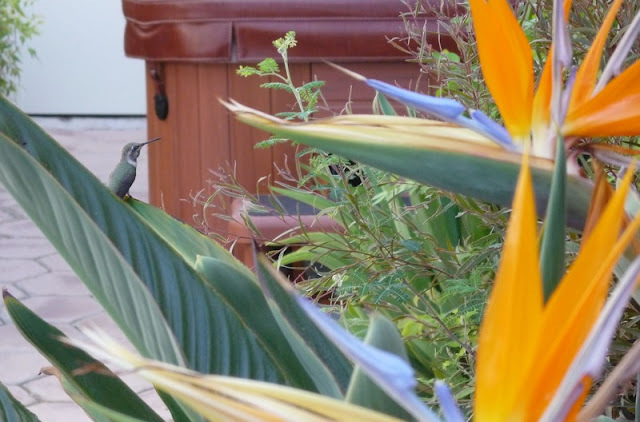 We loved it and so did the humming birds that used to perch on the glossy green leaves. 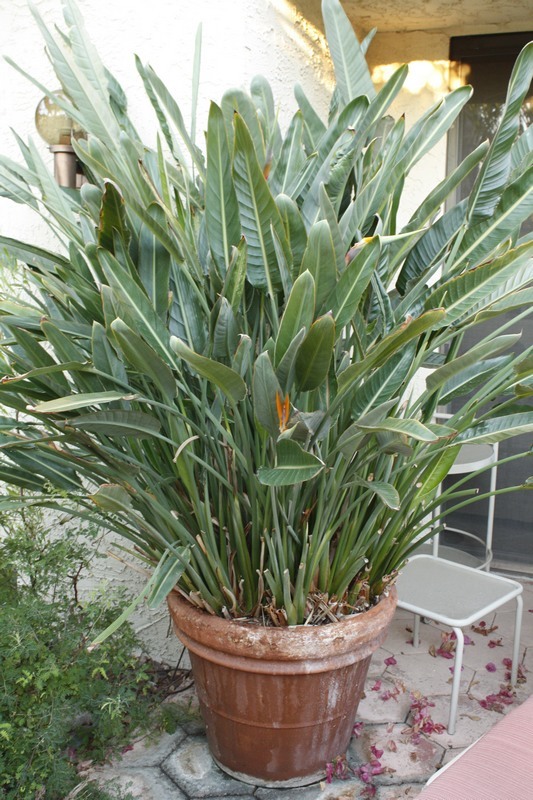 We had to leave it when we moved as the plant and pot belonged to the landlord and anyway it was too big and heavy to move. Our old plant at our last home - believe me - it did flower! 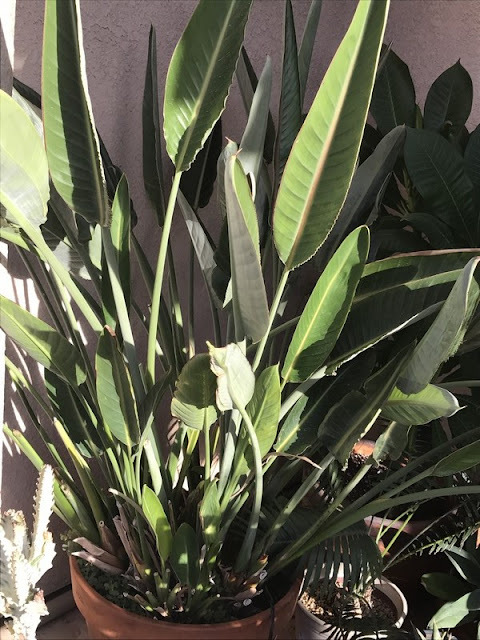 Once we were settled in our current home and started to establish our garden, a new Strelitzia was on our shopping list and we bought a fairly sizeable plant with one existing flower spike and the promise of more. The first summer it languished, being both shredded by winds and scorched by full sun in our exposed yard, so we moved it to the shelter of our house and partial shade under our verandah. For two years it has continued to grow, produced masses of green leaves and yet no flowers until a single solitary spike this summer. We are very disappointed and it's on Philip's hit list if it doesn't perform soon! Its grown but no flowers! 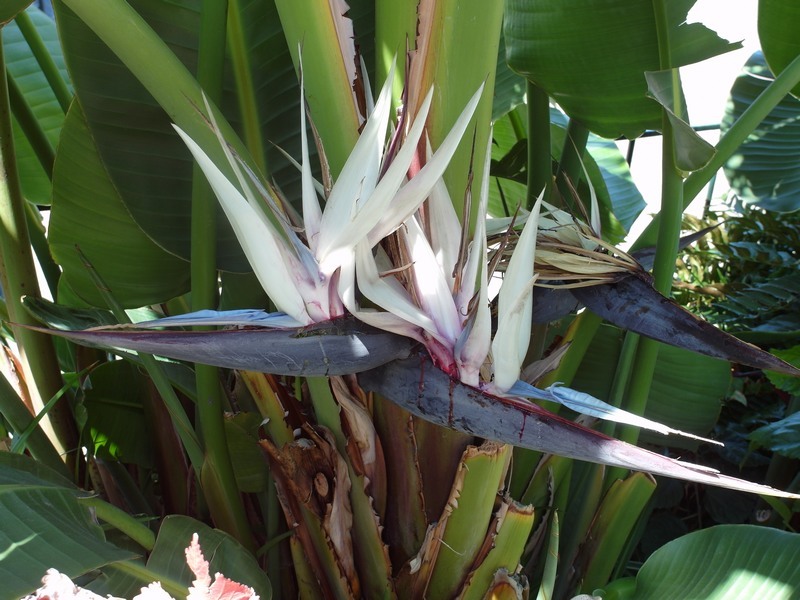 Strelitzias are loosely related to cannas, bananas and gingers. 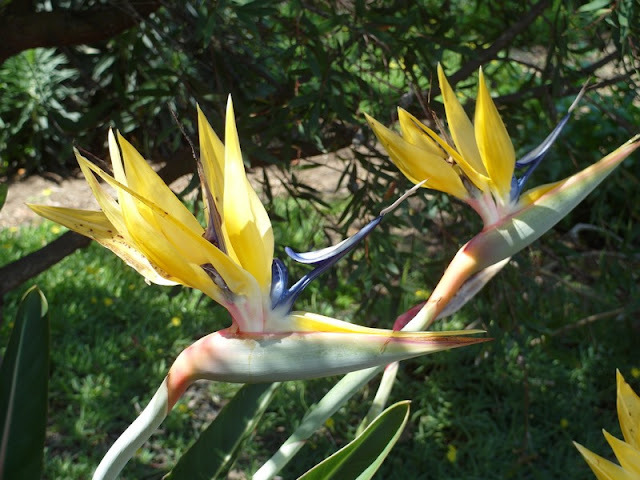 There are several other species and cultivars such as Strelitzia 'Mandela Gold', which has a soft chrome yellow flower, compared to the vivid orange of the species. 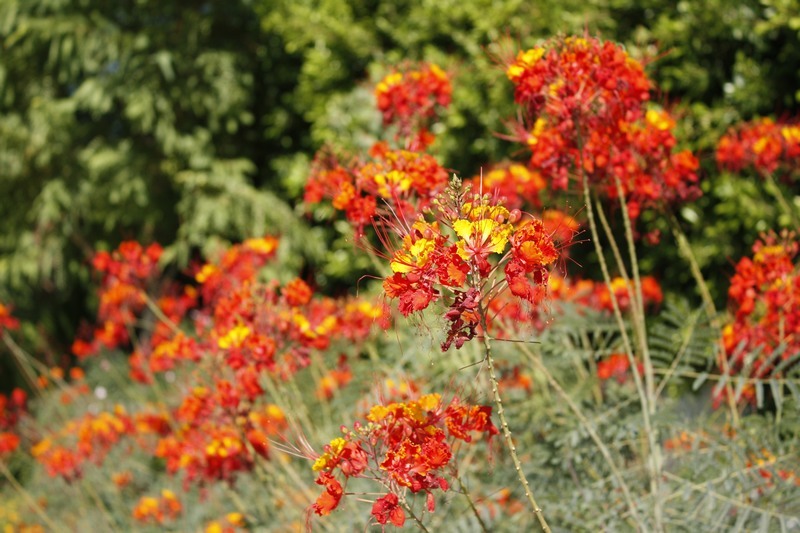 You can also find compact versions of the plain S. reginae, which make great groundcover plants. By contrast, the white flowered Strelitzia nicolai can grow into an immense plant where there is space. We tried one once but it burnt easily in the heat here. 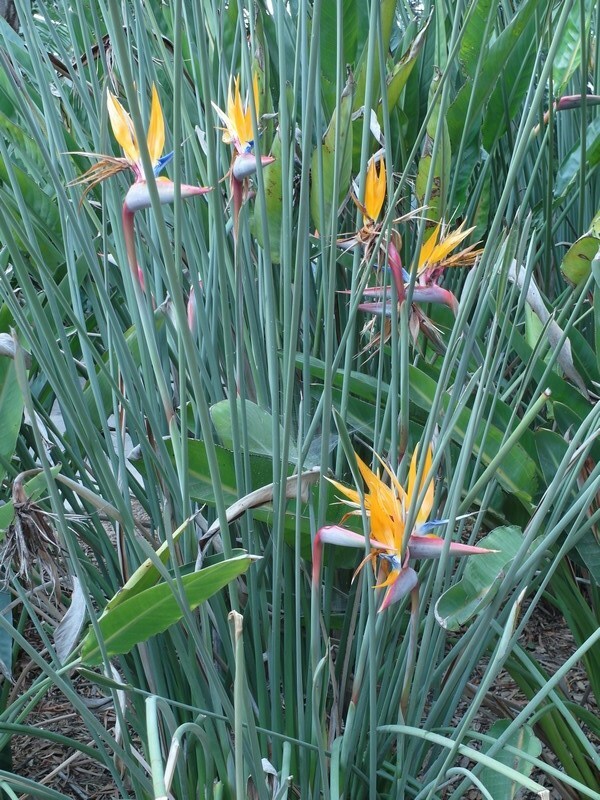 The most fascinating is S. juncea which when mature has narrow cylindrical stems, more like a reed or rush without the paddle leaf. 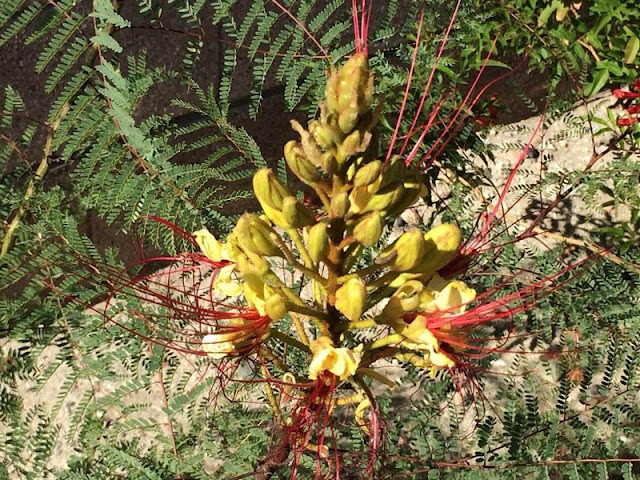 Its flowers are orange. 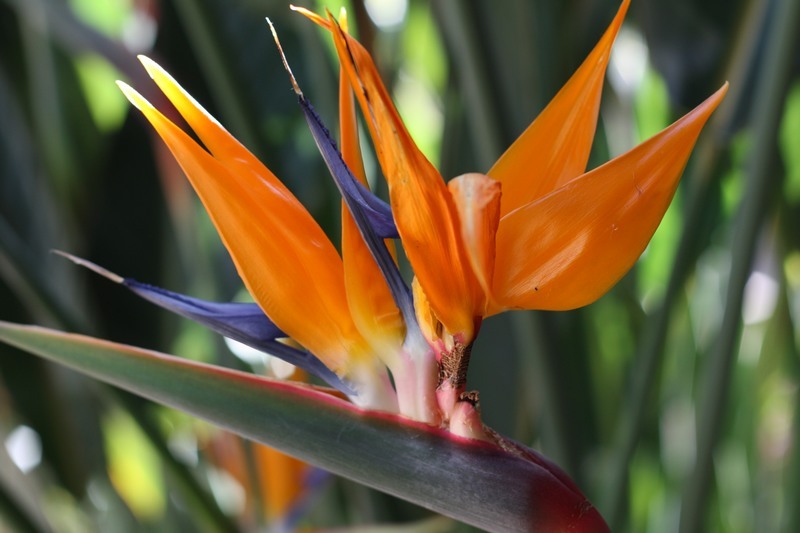 The common name for Strelitzia is Bird of Paradise, which confusingly is also applied to species of the genus Caesalpinia. These two genera that share a common name are not related. So much for 'plain simple' common names! The beautiful orange flowered form, C. pulcherrima, known as the Mexican Bird of Paradise is a widely planted landscape plant that grows easily here and performs superbly. There is also a delicate yellow flowered form, C. gilliesii, with striking red stamens which although lovely is shy flowering. I have both in my small yard. And the humming birds love these too!